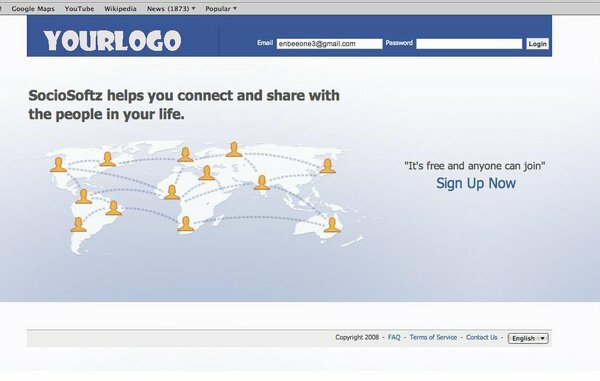 What is a Facebook clone? A Facebook clone can be defined as script which comes with all the features which are necessary to make a website look like Facebook, the most popular social media platform, and more. Overall, software like these 10 Facebook clones allow you to make a complete social network website. Wall.fm is on online social network builder that allows you to make a Facebook clone site without any technical knowledge. Because it is not community software like Oxwall or PHPfox, there is no need to buy hosting or domain. The builder offers the following features: blogs, forums, video and image sharing, simple and video chatting, customizable profile, commenting and rating and tagging. You also have the ability to make the social network private or public. SocialGo is a social network building service that allows you to make community websites with ease. It comes with the most essential features, such as personalized profiles, messaging, forums, text and video chats, blogging, photo and video sharing opportunities. The developers not only concentrate on helping the users create a network with ease, but to monetize it too. There is a classic version, that is for the everyday user looking to easily create a custom social network using preset configuration. And the pro version is for the experienced user looking for advanced customization on a powerful social website. NCrypted’s Facebook Clone is one powerful social networking script created in php that helps you to create a Social networking website similar to Facebook. This script creates feature-rich social community website where users get a huge social environment to communicate with people across the world for various purpose such as professional, dating, friendship etc. Inout SocialTiles creates a communication tool that allows people to interact socially. It helps users who use their platform to connect with their friends, also users of the platform. Social interaction has been facilitated by sharing their thoughts, photos and videos. Inout SocialTiles has implemented a wide variety of technical features, and its backbone consists of a tile interface that displays an articulated list of Friends who are also users of the system. Get started on your dream social network today. PHPFox gives you the ability to create a unique and feature packed social network. You have full control over the scalability of PHPFox. One of the most important factors of a growing website is its ability to be user-friendly and fast. Flippy FBCovers helps you make a clone Facebook timeline cover site. It is an all-in-one solution that lets you upload, organize and share your Facebook covers. You can easily use this script to earn money by adding ads from Google AdSense. Sokial is a social networking script that helps the keen learners to create their own social network fast and easy. Enjoy a light source, clean and unencrypted. Change limitless and add unlimited features as you want. Dolphin is the only all-inclusive free community software platform for creating a customize social networking, community or online dating site without any limits and under your full control. It has 36 module, such as Ads, Blogs, Avatars, Events, Facebook Connect and more. Friendica (also known as Friendika) is an open source software that develops a distributed social network. It has an emphasis on extensive privacy settings and easy server installation. It aims to work with as many other social networks as possible. It was developed by Mike Macgirvin, a software developer who was once employed by Symantec Corporation, America Online (AOL), Sun Microsystems, Netscape Communications, and Stanford University. Kootali is a customizable and all-inclusive social networking script, very similar to Facebook, that lets you create a standalone social community site for allowing users to communicate and connect. It could be romantic, personal, professional or anything else. It gives your users the perfect environment to socialize and network with their online pals. With the awesome features of Kootali, users can also easily form a closed network under any category like workplace, school, college and many more. Your users can network on the site to make, develop, and keep in touch with friends who focus on politics, religion, pets, sports and so forth.